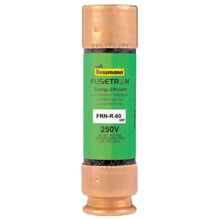 FRN-R-1 6/10 | Fusetron Energy Efficient RK5 Fuses | Fuses | Eaton Bussman | Featured Lines | Piela Electric, Inc.
FUSETRON® fuses are on average 23% more energy efficient than the next leading brand. Class RK5 dual-element time-delay fuse 200kA Interrupting Rating. Separate overload and short-circuit elements provide time delay for sizing as close as 125% of motor FLA. Insulated end caps for 225A-600A fuses reduces exposure to live parts and extends air gap to distance between blades of adjacent mounted fuses or to housing. Easy upgrade for one-time and renewable fuses installations. Because the Fusetron Class RK5 fuses fit any Class K5 or H fuse blocks and holders, you now have the opportunity to upgrade your circuit protection and save even more.